Prom suits are designer style fashion suits for Prom that have tuxedo style but are not full tuxedos. You will find that they have a slim fit like you see Celebs wearing. If you don't feel like wearing the standard tuxedo to your Prom. Well, ContempoSuits.com has got your back with our fine selection of unique Mens Prom Suits and matching color Stacy Adams Shoes. 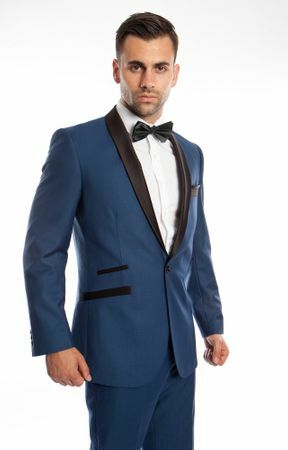 Mens Prom Suits are not quite tuxedos but will make the wearer stand out in unique style for formal events like Proms and Homecomings. Being stylish is more than just putting on a Mens Prom Suit, it takes a certain attitude to pull off, so it's important to do it right with the right unique prom suit, matching shoes and shirt. Our fashion suits for Prom will get you noticed fast. A unique Prom suit can be explained as synonymous with the term Tuxedo as it is a suit that is worn for a formal occasion. For many Young American males, the Prom or Promenade is the first time to really dress for a formal dinner dance. It is considered to be coming out party for both young men and women and that is why there is so much effort for everyone to look their absolute best. Mens Prom suits these days change styles from years past in the fabrics used, the colors employed and the fit of the suit itself. Looking back through old Prom photos can be both funny and historical at the same time. Prom suits have changed and certainly come a long way from what was worn back in the seventies. Whether you're 2 piece man, a 3 piece man or a double breasted man, our Mens Suits have something for everyone. See all of the fine styles by Belvedere Shoes. You can really make heads turn at the Prom with our Zoot Suits.